Third biggest party, the anti-immigrant A-holes got 12.9%. News has hit of the first confirmed Ebola case in the United States. While this news is still breaking and developing, it appears to be a case that was after symptoms and travel disclosure of a patient in Dallas at the Texas Health Presbyterian hospital in Dallas, Texas. The patient was said to have left Liberia September 19, showing no symptoms but began to show symptoms on the 26th. On the 28th the patient began receiving care at the hospital in Texas. Specimens have now tested positive. The next steps are to care for the patient as safely as possible and then to identify all people who may have had contact with the patient and then monitor those people for 21 days. That's terrible, Anna! We have a case of Ebola here too in the Netherlands, if I'm not mistaken. Our news has been busy with the monster truck accident that happened on Sunday. There was a monster truck show in Haaksbergen and it was doing some stunts, then it drove into the public. One little boy, a man and a woman have died . It's all very sad and it raised questions as to who's responsible and why the audience was too close to the stunt, about the permits etc. I hope the world health community ranks the Ebola virus high on the list of health concerns as it could become a virus wiping out many, many people. IMO all steps should be taken to contain the virus and quickly find a cure. It scares the devil out of me. As many as 80 people had contact with the first person to be diagnosed with the deadly Ebola virus in the United States, a significant jump from the 18 cited earlier, NBC News reported on Thursday. I Know! And reading Oryx and Crake/ The MaddAddam Trilogy doesn't help at all. The worst part of that Dallas hospital incident with the Ebola infected man was that they sent him home 3 days prior to his being diagnosed. He'd gone to the hospital and did tell them he had recently travelled from West Africa. Serious breakdown in communication of the hospital workers, it seems. Here is a nice bit of local news regarding one offshoot of the film industry shooting so many movies in New Orleans, and the surrounding area. In fact, we've become affectionately known as Hollywood South. LSU is the local state university (in Baton Rouge, our state capitol), located only about 65 miles west of us, but 80 miles from N.O. and carried the disease through several different Countries enroute to the U.S..
That to me is just... 12 Monkey's type frightening. Yes, I just read that on WaPo earlier. Awful. The next pirates of the Caribbean movie is being filmed in QLD, Australia! Wow, that's pretty terrible! I can't believe people would be so stupid . ^^ Devi, I'm lol at that post by Gaia, it's like, terrible disease/ end of the world quote then yours about the movie I love it. Yep sorry that was a little unfortunate . Oh no, I thought it was hilarious! Steven King compares current IS (Islamic State) and state of the world with 1984. A building in our French Quarter, built in 1830 partially collapsed, now they have to tear it down completely. Luckily no one was hurt, except the pocketbook f the owner....he will have to foot the demolition costs. Ouch! 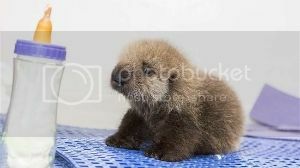 A crying abandoned 5 week old sea otter pup was found south 3 hours from here. She has found a new home in Chicago. "The beachgoer heard the newborn pup crying and notified marine officials. But rescuers at the time couldn't reach the pup because it was in a remote location and darkness was falling. The following morning, Pup 681 was rescued and taken to Monterey Bay Aquarium, where experts quickly set about fattening her up given that she had been separated from her mother for an estimated least 16 hours or more. In Chicago, six to eight animal-care experts will continue monitoring the pup round-the-clock." Southern Sea otter populations in California have slowly recovered over the years. This year, the population is at 2,944. The poor otter! So cute! I'm glad they found her. The opposition let the nationalist (aka rasist) party create a chaos so big that the government had no choice but to announce a new general election. The rasists said "we will vote down every budget proposition until the immigration pace is slowed down". The opposition parties didn't care, and together with the rasists voted no on the new budget. Frickin sandbox and playground behavior!!!!!!! After failing to get the government suggested budget approved in the Swedish parliament this afternoon, Swedish prime minister Stefan Löfven from the Social Democratic Party held a press conference with education minister Gustav Fridolin, from the Green Party. There, they announced that the government will proclaim new general elections. The election will be held on March 22 next year. – We want to give the voters a new possibility to take stand in this new situation, said prime minister Stefan Löfven. Yesterday the nationalist Sweden Democratic party announced it would support the budget suggested by the opposition parties. After voting in the parliament, it was clear that the government suggested budget had fallen. – We regret that the Sweden Democracts have driven a political crisis, and that the opposition alliance refuse to cooperate, said Gustav Fridolin. I don't know that much about politics, but I hope things get better in your country soon, Emelee . One could hope. I am so sick of polititians acting like they're in a sandbox. Especially the right-wing parties. At least the current Prime Minister is taking responsibility. He tried to reach out his hand to everyone but the rasists. The opposition refused. Why they have so many voters is so beyond me.